Vancouver Island University has spearheaded a new initiative to ensure LGBTQ students and faculty are acknowledged by the university’s broader commitment to anti-oppression. The university’s Positive Space Alliance (PSA) has painted a prominent staircase on its Nanaimo campus to reflect the colours of the rainbow flag — a historic symbol of freedom and struggle for the LGBTQ community. The staircase will also be accompanied by a sign detailing the cultural significance of the flag. rainbow-coloured staircase on its Nanaimo campus. 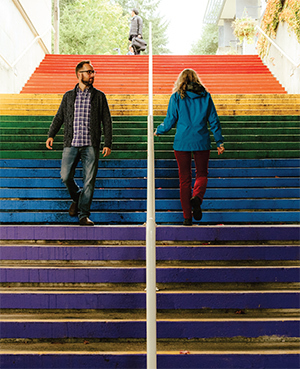 The rainbow staircase, located in a high-traffic area near building 300, took its inspiration from similar queer-positive initiatives installed in public spaces across British Columbia. Michael Olson, an active member of the PSA steering committee and executive director of the VIU Students’ Union, says the rainbow staircase is a perfect fit for campus. Mr. Olson says he has seen an outpouring of support on social media from students and faculty noting the location and scale of the rainbow staircase, and the positive impact it has already had on campus life. The PSA is also involved in several other queer-positive initiatives across the university, including awareness-raising workshops and the implementation of non-gendered washrooms on the Nanaimo, Cowichan, and Powell River campuses. “These washrooms were converted with virtually no incident, in part due to the educational component in the form of signage in each of the washrooms,” Mr. Olson says. Mr. Olson says the PSA is working with the university on plans for more inclusivity in the designs of newer buildings.